My wife Angela and I just concluded a whirlwind 12-day visit to the West Coast that included baby Naomi’s first airplane ride, her first family road trip courtesy of the new Ford Fusion, celebrity encounters with film stars, hanging out with hundreds of influential Latinos and a special development for PapiBlogger that will greatly benefit the future of this family forum. 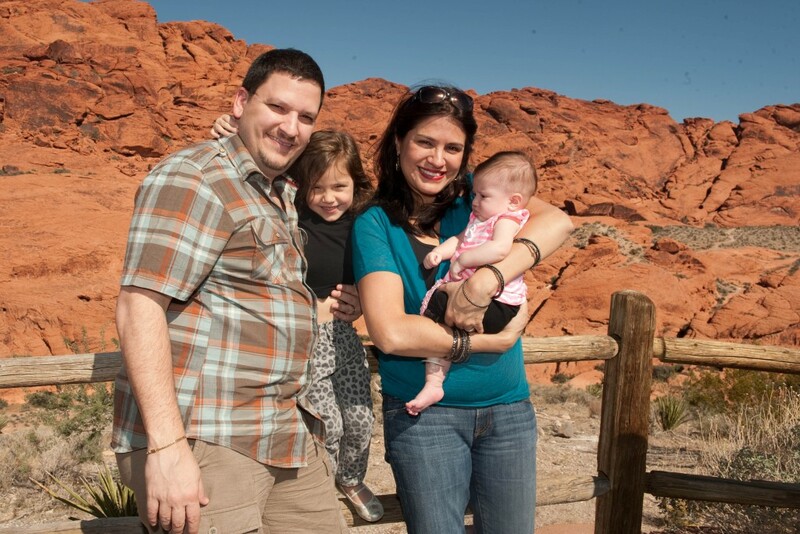 Three months after her birth Naomi “finally” got her first plane ride on JetBlue (I was 16 before my first flight). Our trip from Ft. Lauderdale to L.A. was a good one for Naomi who took special interest in looking out the window but what made the flight extra interesting was that mid-flight I discovered I was sitting next to the incredibly talented tween actress Bailey Madison (“Bridge to Terabithia” and “Just Go With It”). Actress Bailey Madison and I.
I’ve met a lot of famous people in my life but what struck me about Bailey and actually prompted me to ask her if she worked in Hollywood was the extremely mature, polite demeanor I witn essed about her as she interacted with our JetBlue flight attendant, her mom and even me. We spent more than two hours chatting about numerous topics related to filmmaking, faith and serving others through our God-given gifts. I even had a chance to personally show Bailey and her mom the official event trailer video for Hispanicize 2013 so don’t be surprised if this wonderful actress makes a cameo in Miami Beach next April. Trust me when I say that Bailey is going to be a huge actress. 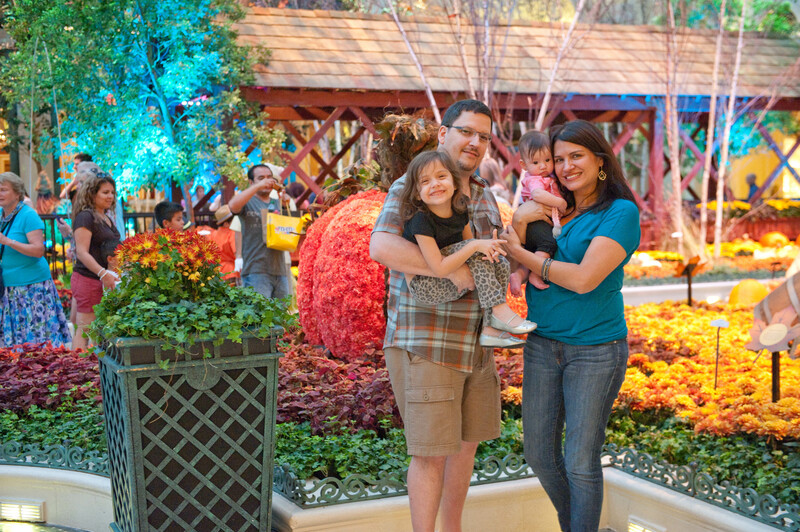 The reason for our trip to L.A. was to attend several West Coast events and meetings, including the annual blogger conference Blogalicious 2012 that was taking place this year in Las Vegas. The new Ford Fusion has a muscular but sporty look and gets incredible mileage. A few weeks ago I attended a special event in Miami that introduced the world to the new Ford Fusion so when the Ford team learned that I needed a car for my wife, two youngest daughters and a family friend to visit Las Vegas, they immediately offered us the chance to drive the brand new Fusion. 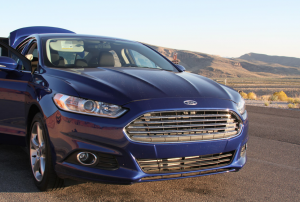 The Fusion is considered Ford’s flagship vehicle and the most important launch in years. 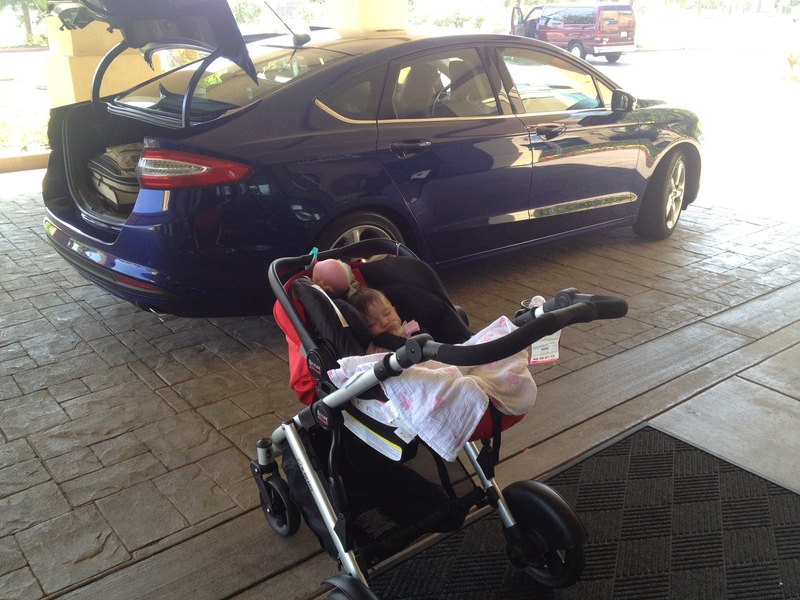 Naomi doesn’t go anywhere without her Britax car seat and stroller. I’ll be honest with you, at first I didn’t really think the Ford Fusion would be able to accommodate all of us, our luggage, Britax car seats and stroller, cameras and computers. 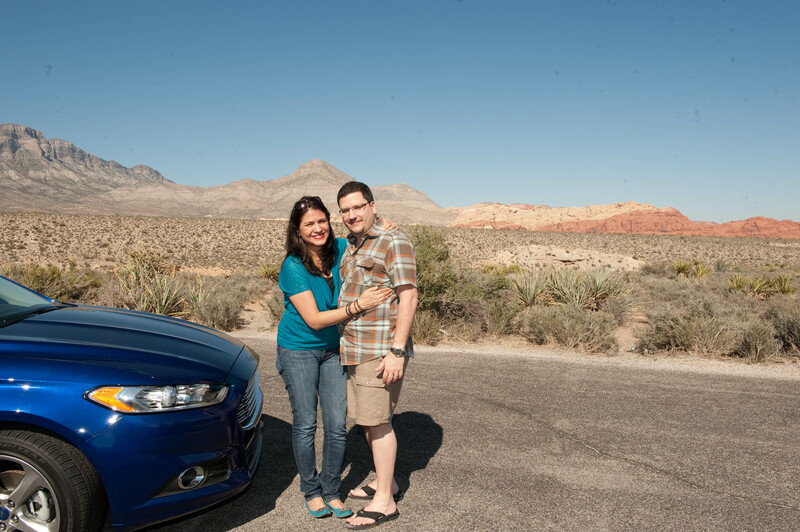 Incredibly, the Fusion not only fit us but it also provided us with a comfortable, smooth ride to Las Vegas that was especially needed because we experienced massive delays driving through L.A.’s Infamous “Carmageddon”. (Carmageddon refers to the hyper gridlock situation that occurs in L.A. expressways whenever major road repairs are scheduled). 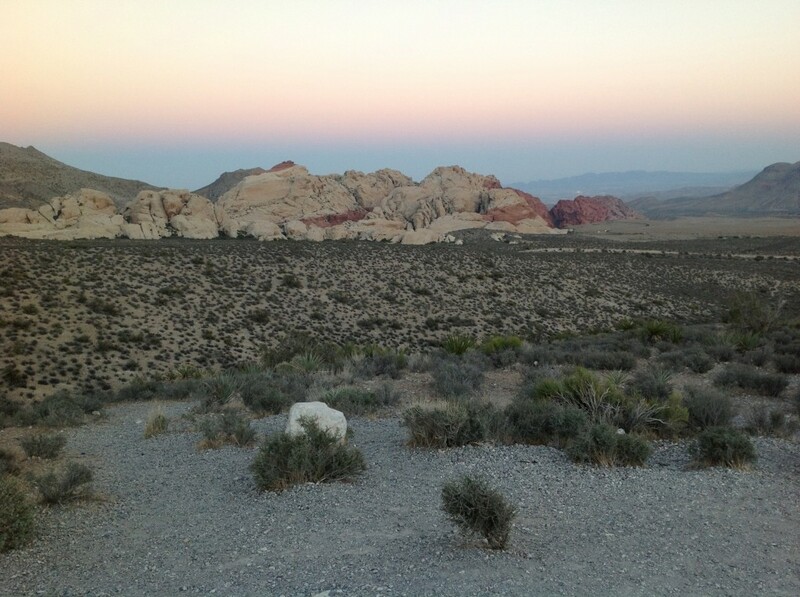 The L.A. To Vegas trip normally lasts five hours but thanks to Carmageddon it took us more than 9 to get there. 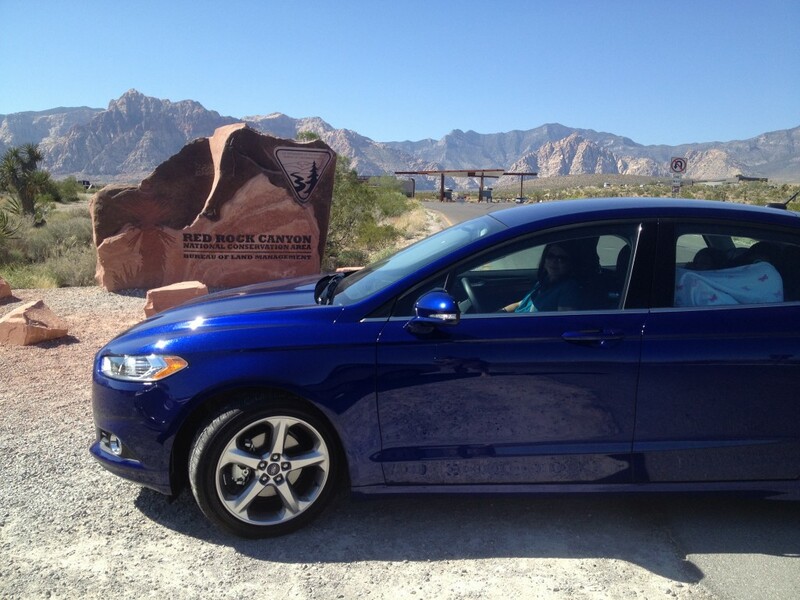 The sporty-looking Fusion is a gas-saving dream at 47 miles per gallon and didn’t need to be refueled until we arrived in the Red Rock Canyon area of Vegas. 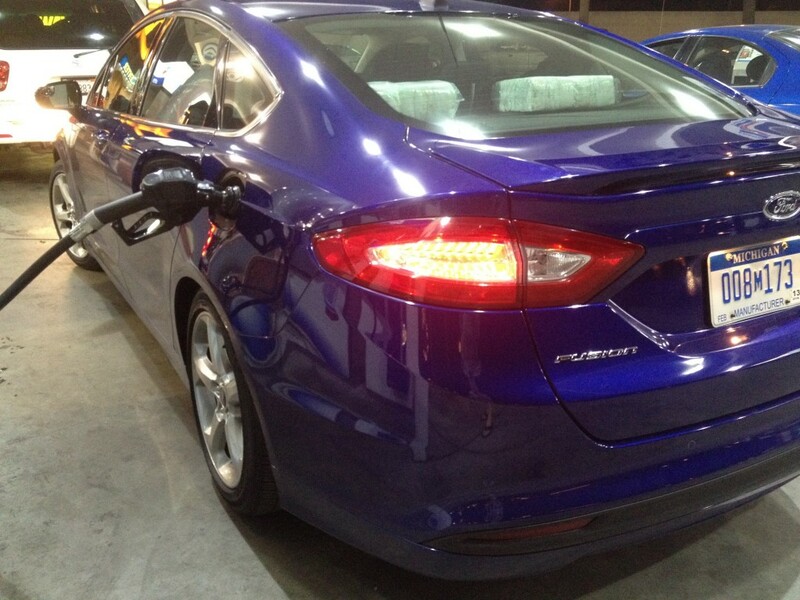 The fuel never seems to end on a Ford Fusion vehicle that does 47 miles per gallon. We only refueled once. My Hispanicize Digital family (from left to right): Lance Rios, Katherine Johnson, Cristy Clavijo-Kish, Angela Sustaita-Ruiz and I. 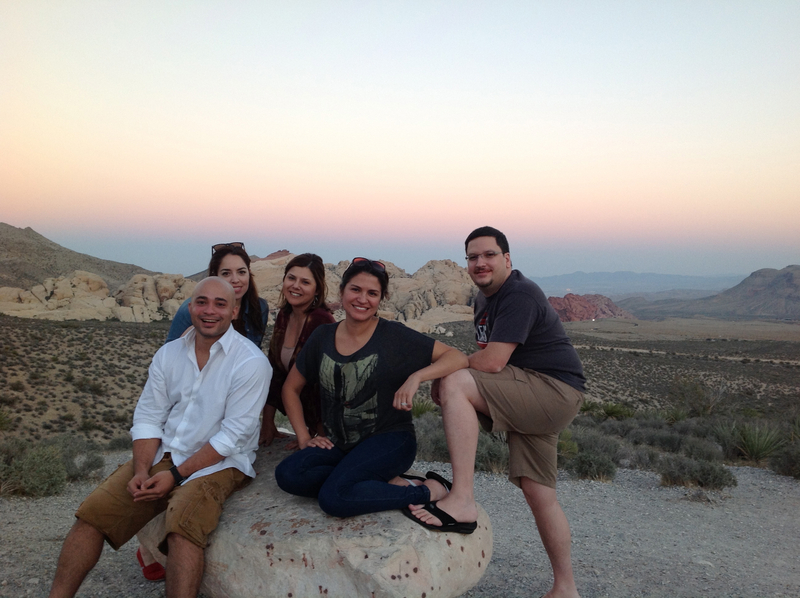 After the Blogalicious conference ended we took our business partners Lance Rios of Being Latino, Cristy Clavijo-Kish of Hispanicize Digital and Katherine Johnson of Hispanicize 2013 on a Ford Fusion ride to Red Rock Canyon National Park, where we held a picturesque company retreat. Angela and I love Red Rock Canyon so much that the next day we repeated the trip with our girls. 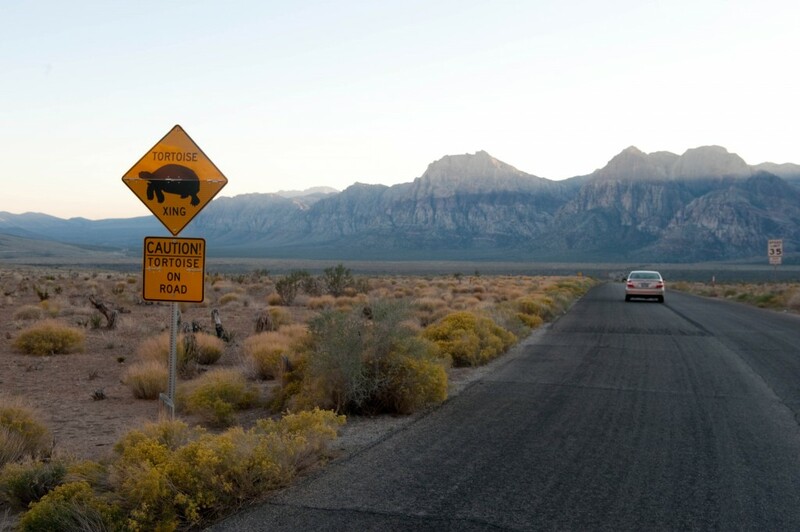 Red Rock is an awesome place to drive with winding roads, jutting rock landscapes and lots of desert but you do need to watch out for donkeys and tortoises. Yes, really. 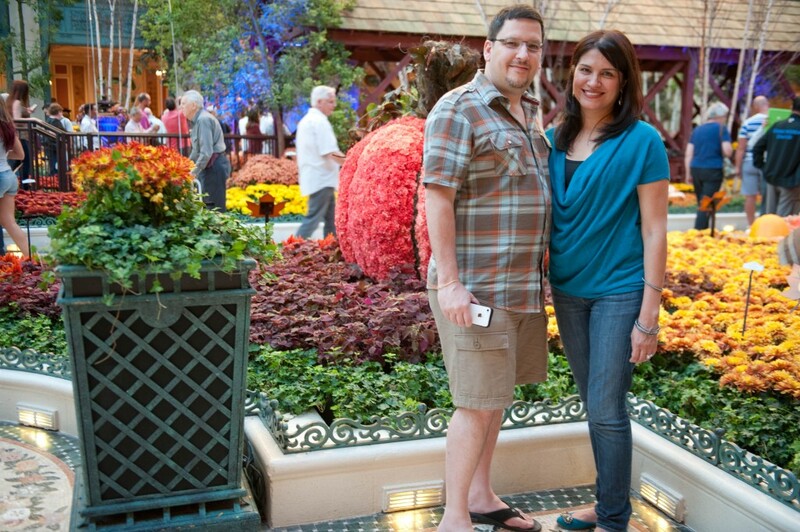 Before leaving Las Vegas my wife and I took the girls to a very special place: the Bellagio Hotel on the Strip. The Bellagio was the site of our first official date March 31, 2006 because that’s where we went to see Cirque du Soleil’s world famous “O.” The highlight of our Bellagio visit was recreating our famous first date photo as best as we could. We did one without the kids and another after the kids. 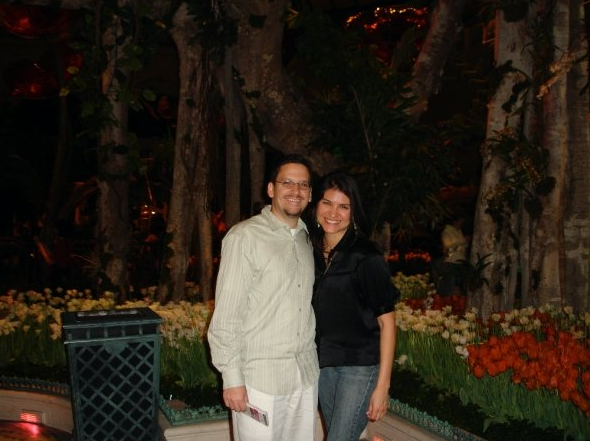 Our first date: March 31, 2006 at the Bellagio. 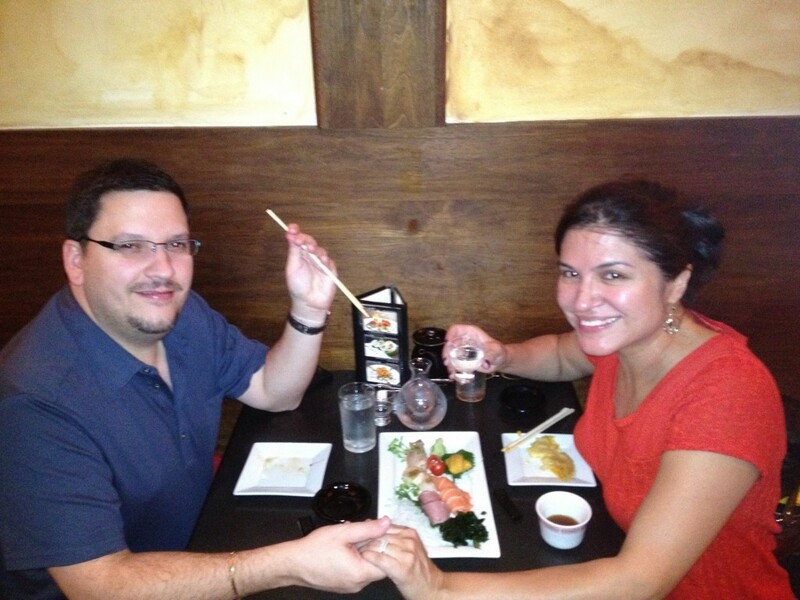 First Date Photo Recreated: Oct. 1, 2012. 6 1/2 years later. 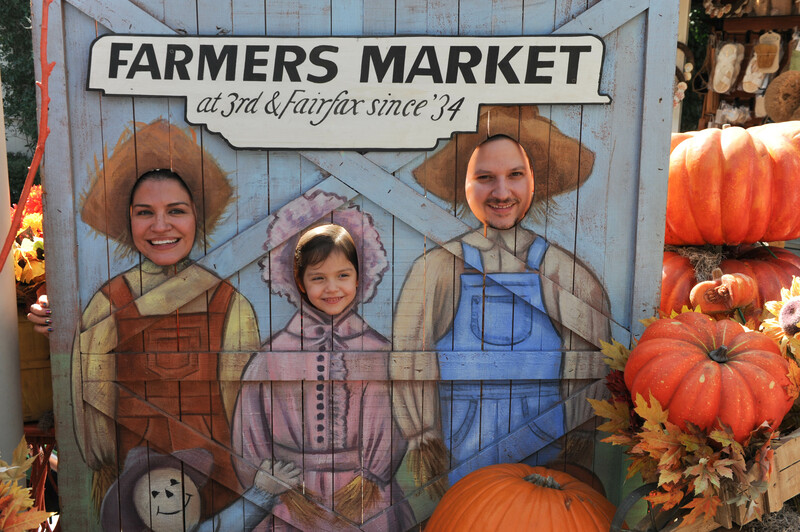 First Date Photo Recreated: Oct. 1, 2012 with our two girls. The first major event of our L.A. Trip was the annual Hispanic Public Relations Association (HPRA) PRemio Awards, which my company Hispanicize 2013 and the Hispanic PR Blog co-title sponsored this year for $10,000. More than 200 colleagues assisted the dinner at the historic Cicada and I took the opportunity to showcase the Hispanicize 2013 event to everyone with this fun preview video. If you wonder why I haven’t been able to post as much content to PapiBlogger lately it’s precisely because of how focused I am on making Hispanicize 2013 the best work of my career in media and marketing.After four days in Vegas we returned to L.A. for an intense week of events and meetings related to our Hispanicize 2013 business, a feature length movie project that I’m in pre-production for and even PapiBlogger. The friends and fans of Hispanicize 2013 keep growing so much that two days later we decided to do a Los Angeles Latino influencers meet up at Planet Dailies restaurant in the Grove. Forty one people showed up generously sponsored by Sprint including Hollywood director Norberto Barba (“Grim”), music industry leaders, several major Hispanic brands and Latino bloggers. The event was supposed to last from 9 to 11 a.m. but it didn’t fully conclude until 3 p.m.
My wife didn’t think we had been busy enough so in between everything she scheduled a TV commercial shoot for a client of our Latina Mom Bloggers network. 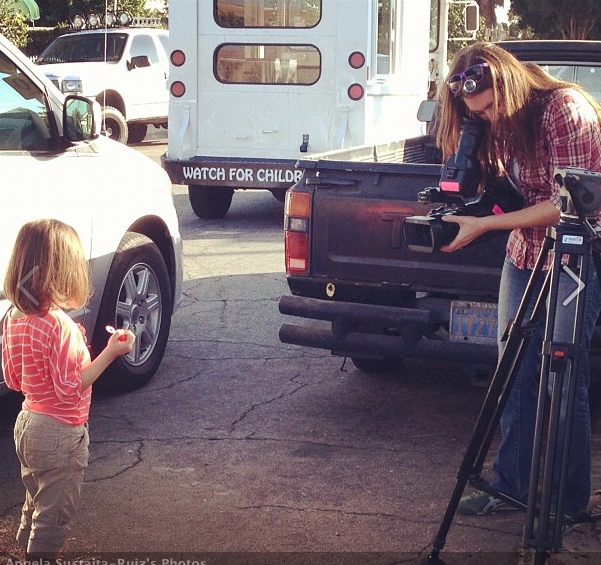 My 4-year-old Briani warms up the cameras for a Latina Mom Bloggers client photoshoot. 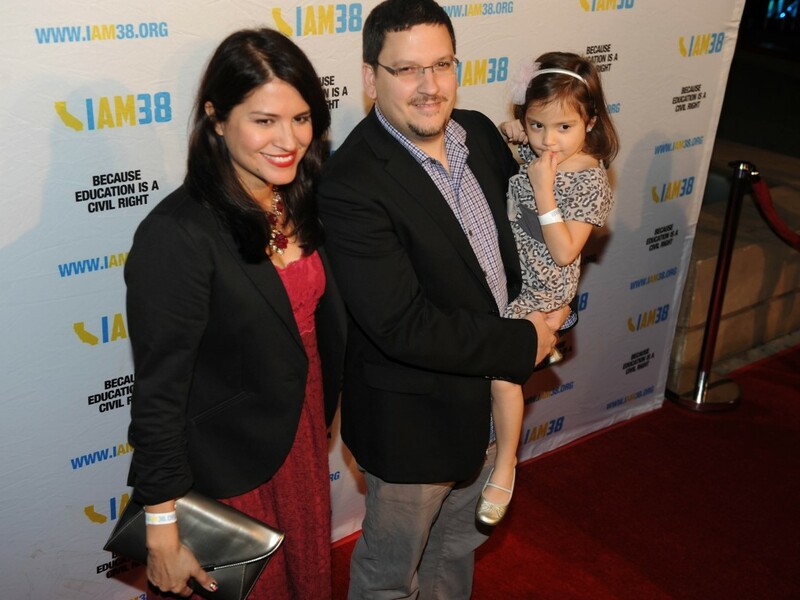 Three days later Angela, my daughter Briani and I attended a Latino Hollywood screening of the motion picture “Filly Brown” that was held by my good friend Rick Najera and actor Edward James Olmos to galvanize support for Proposition 38 in California. 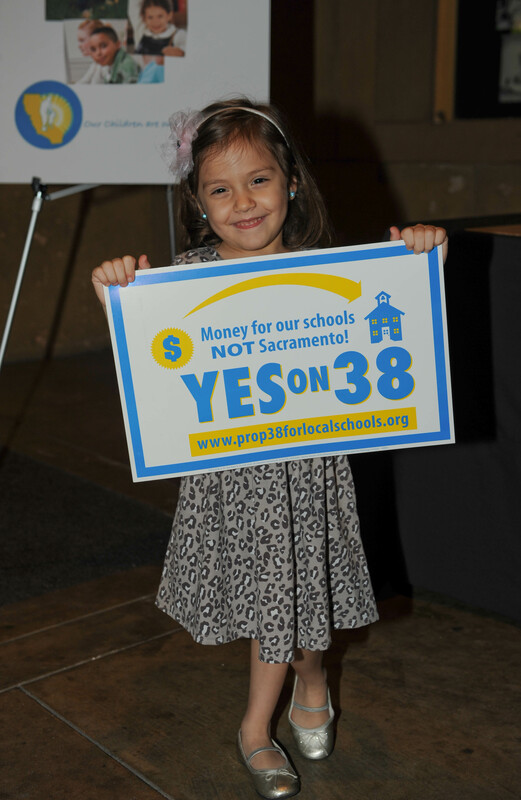 Proposition 38 is seeking to ensure that educational funding in California will both increase and be fortified from political tampering by the state’s governor and legislators. For Angela, Briani and I it was our first ever red carpet as we were invited to walk the celebrity-filled Red Carpet along with other celebrities like Olmos, director Michael D. Olmos (“Filly Brown:), Lou Diamond Phillips (“La Bamba” and “Stand and Deliver”), Gina Rodriguez (“Filly Brown”), director Gregory Nava (“Selena”) and Yahira ‘Flakiss’ Garcia (“End of Watch”), among others. The experience of walking the red carpet and having photographers and journalists interview you during the red carpet is both intense and exhilarating especially when you legitimately have a film to tout. Our red carpet invite was strictly because of our Hispanicize event and social media platform but it’s no secret that if Angela and I ever walk another red carpet again I want it to be related to my own film. (Filmmaking is my most fervent dream but that’s a topic for another post). One of the highlights of the night was when I walked up to Lou Diamond Phillips and informed him that Hispanicize 2013 will be putting together a major celebration of his cult classic film”La Bamba.” Look at this video for his surprising reaction. To start our anniversary weekend off Angela and I took our daughters to a delightful Mexican restaurant in East L.A. called La Serenata de Garibaldi. It was there that the mariachis in this video played a delightful rendition of “Mi Linda Esposa.” After five years of marriage and six years together, all I can say is Amen for my wife! The biggest treat Angela and I gave ourselves during our 5th year wedding anniversary weekend was going to view the Oscar-worthy film “End of Watch” and seeing New Order in concert at the Greek Theater. 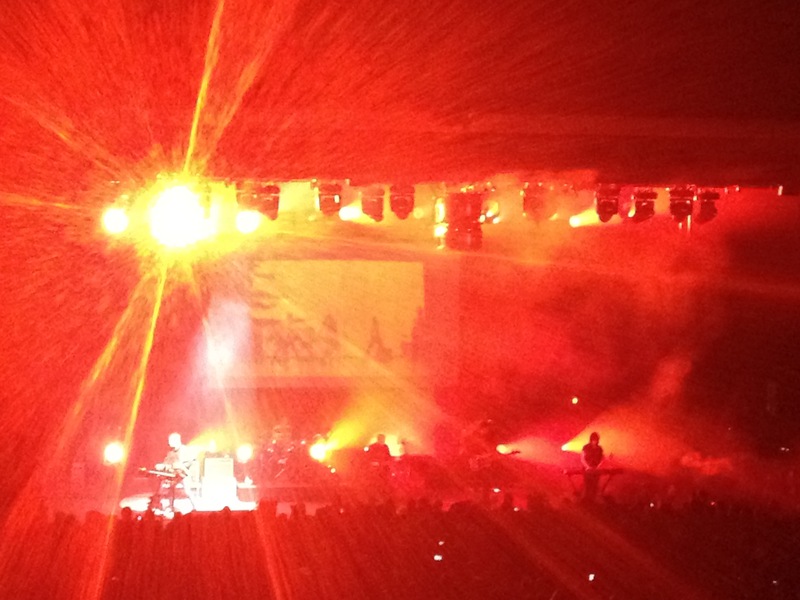 I was a rocker in the 80s but I must say that New Order was amazing and they don’t seem to have lost even a tiny beat. The Greek Theater itself is also a wonderful outdoor venue. New Order didn’t miss one beat during their Greek Theater Performance in L.A.
On the last day of our trip I went to visit a great friend and former longtime corporate client of mine who has joined forces with me to produce PapiBlogger. West Coast PapiBlogger will be revealed soon. 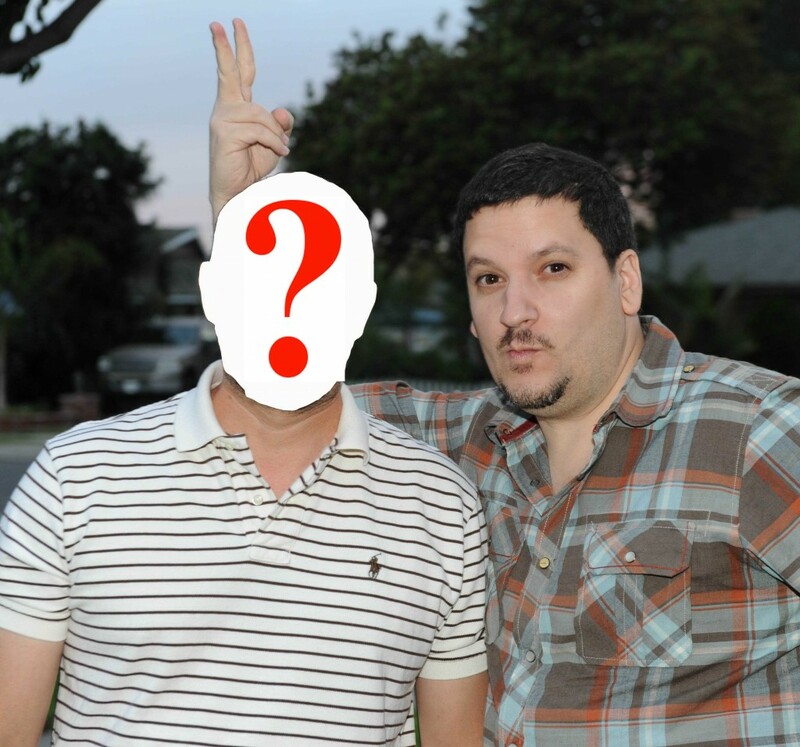 Can you guess who this really cool guy is? Suffice to say, West Coast Papi (as I nickname him) is the REAL deal. God willing, over the course of the next several months you will see that my great friend and I will be taking PapiBlogger to a much better and larger place than its ever been before. Who is this mysterious West Coast Papi? I will tell you everything soon but in the meantime here’s an incomplete photo that we will be fully revealed next week.